Download the free BoxHotel app from your App Store.
" We are proud to offer good accommodation in downtown locations at discount rates. " Thanks to the efficient use of space in an area of just a few square meters, a comfortable sense of space and a exceptional feeling of privacy has been created through special architecture and design elements in our boxes. Best night’s sleep! In order to be able to offer you excellent sleeping quality, we have equipped all the boxes with “Stiftung Warentest” prize-winning mattresses. The BoxHotel offers you overnight accommodation at an extremely attractive price. Sleeping doesn’t have to be expensive! Stay with us and sleep on the best mattress ever to be tested by “Stiftung Warentest”, enjoy an architecturally unique space with high-speed Wifi, and many other amenities. We offer you all this at an unbeatable price well below the market average. You can reserve a single box, for €24.99 on our website. The world’s first completely app-based hotel replaces the traditional reception desk with your smartphone. 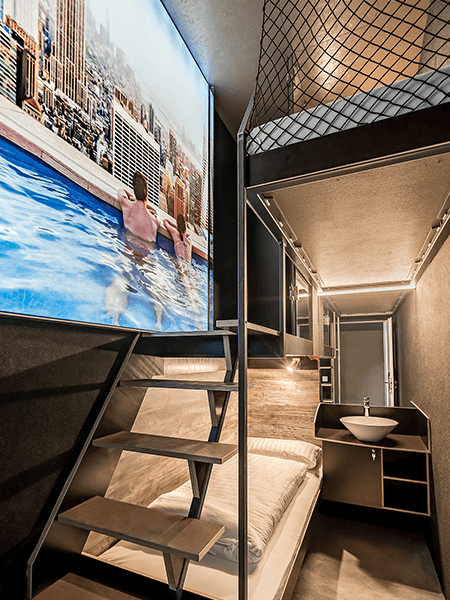 With its revolutionary, clever construction, and an innovative overnight concept, the BoxHotel creates a whole new hotel category between hostel & hotel. Each BoxHotel is located within the city. The city center is usually reached in just a few minutes. There is plenty of shopping, great restaurants, and an active nightlife in the city center. The hotel is usually near public transportation and is usually well connected via bus stops and train stations. The BoxHotel is a particularly environmentally friendly rendition of the accommodation concept! Existing downtown areas are reinvented as a hotel! We build with the most efficient land use inside the city limits. The available space is optimally used and the unused free space is largely dispensed with. The BoxHotel has energy-saving LED lighting. The BoxHotel uses water-saving shower heads. Free high-speed Wifi is available in all rooms. Do I have to have the app to book my stay? Yes, because you need it to conveniently open the doors and use the services in the hotel. Please reserve and check in online before you arrive - on the day of arrival you can then open the doors using the app and Bluetooth. Staff are always available in the hotel to help answer questions or deal with any problems between 3pm and 11pm. Everyone is guaranteed access to their box and a great night’s sleep. DO I HAVE TO RESERVE ONLINE? Yes, absolutely. Since we work locally without a traditional reception desk it is not possible to accept a cash payment in person. So, you have to reserve online before you arrive. 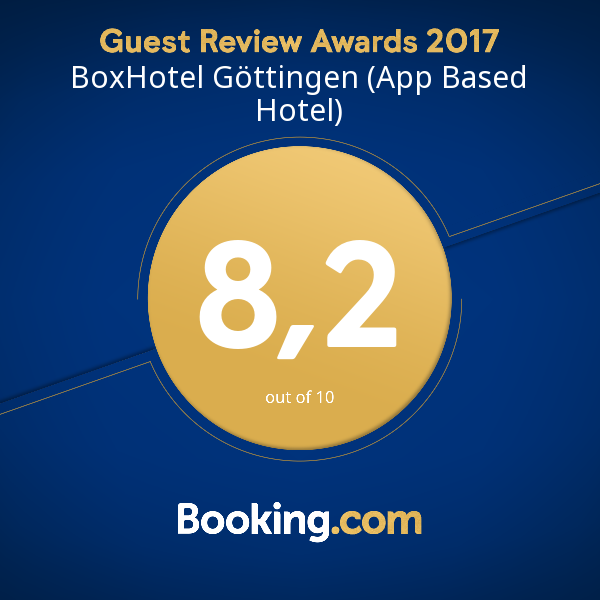 You can pay at boxhotel.de by credit card or on booking.com with PayPal or via "Sofortüberweisung" (direct debit service). WHEN CAN I ARRIVE AND DEPART? All boxes are clean and available for check-in from 3pm. Since we are a fully app-based hotel, you won’t need to deal with hotel staff. Instead, you arrange your stay and arrival time yourself. You can open the hotel door and your room door through the app. Check-in is available from 3pm and check-out is until 11am on the day of departure. Late check-outs are, unfortunately, not possible. WHAT BOX TYPES ARE AVAILABLE? The BoxHotel has three different sleeping boxes. The single box can be reserved for just €24.99. It is furnished with a bed for one person and a washbasin. You can reserve a Standard Box for €29.99. There’s a sofa bed and a washbasin on the ground floor as well as a bed and shower upstairs, accessible by in-room stairs. The box is 3.6 meters high and can accommodate two people. There is a double-occupancy surcharge of €7.99 for the second person. In addition to the Standard Box features, the upstairs bed in the Comfort Box is 40 cm wider. This box can be reserved for just €34.99 for single occupancy. There is a double-occupancy surcharge of €7.99 for the second person. 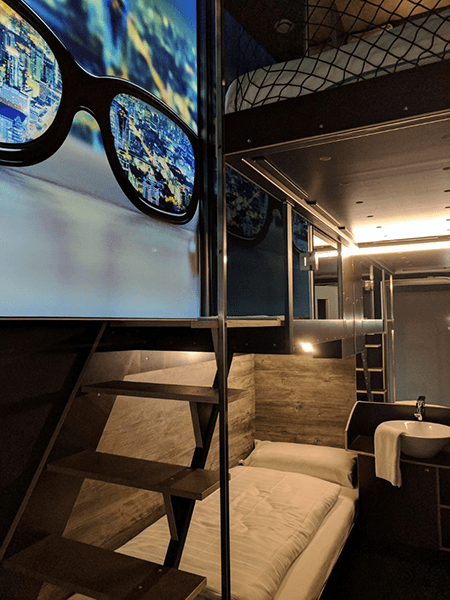 The BoxHotel is a 100% non-smoking hotel. However, if you absolutely must smoke, you can do so near the hotel entrance. Remember to use the ashtrays and keep the area clean. What if my phone doesn’t work? The hotel has a service bell—please use it to contact on-site staff. In case there is no on-site staff available, please call our central service hotline at +49 551 633 74858. This is a 24-hour hotline and we will make sure you definitely have access to your Box. If you have something to do after check-out or if you arrive at the hotel before check-in time, you can arrange for your luggage to be left in our back office after speaking with our staff. The BoxHotel focuses entirely on a good night’s sleep. You’ll always get the best night’s sleep with us! Snacks and drinks are available at our vending machines in the reception area. Food services and breakfast are always located near the hotel. BoxHotels are always located in the city center. For more details on offers and discounts in the area, check out the BoxHotel app. Some nearby restaurants, clubs, and other businesses offer special customer discounts for BoxHotel guests. More information can be found in our app and on our hotel website. Are there toilets in the Boxes? No, toilets are available in the shared bathrooms. The boxes themselves do not have their own toilets. Do the Boxes have windows? No, but our boxes have a special ventilation system. Even without windows, you can always breathe freely! 1,000,000 liters of fresh air a day—as much as you breathe in 100 days. Do you have any questions? We are happy to answer them! To prevent spam, please add the numbers up and enter the total into the field. ("CAPTCHA") This additional security check allows BoxHotel to prevent automated log-ins and improper use of the website. How do I find affordable hotels in good locations? Centrally-located accommodations tend to have a big problem—they are disproportionately expensive! When looking for a reasonably-priced room, you often end up in a hotel far from the city center. Instead of spending money, you’ll end up spending a lot of time on travel. BoxHotel has challenged this problem. We offer affordable hotels that are always centrally located. How do we do it? Our secret is in the type of hotel we have. 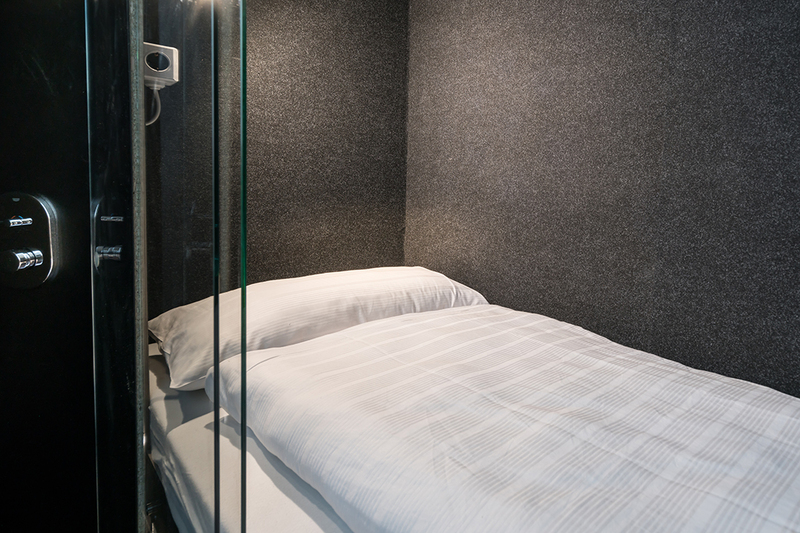 We do not use traditional rooms, but rather offer sleeping comfort in a small space-- in a box! We value simplicity and functionality over luxury and you still get everything you need. You have your own bed with an award-winning mattress, and even a shower. Even the most affordable youth hostels can’t compete with our value for money. Another advantage is our automatic reservation and check-in process, which requires just one app, making us more efficient than other budget hotels. Use our app for everything from reserving to unlocking the door of your hotel Box. Staying in a hotel has never been so easy! WHO ARE OUR BOXHOTELS FOR? Even if we aren’t a five-star hotel with individual suites, you don’t need to go without sleeping comfort with us. We place a lot of value on good furnishings, even in the smallest of spaces. We offer a great and affordable alternative to traditional hotels to anyone looking for budget accommodation in the city center. For students still hunting, for the perfect shared apartment. For business people, who need a bed after a long day of meetings. For couples, who would rather invest their money in a city trip than in overpriced hotels. For freelancers, who are only in town a few days a week. We solve the problem of scarce living space and overpriced accommodation rates by offering everyone our new and innovative concept of affordable sleeping space— all through our easy-to-use app.